About 17 percent of the class of 2020 will be made up of Pell Grant recipients, a new high for Northwestern, Michael Mills, the associate provost for university enrollment, told The Daily on Wednesday. 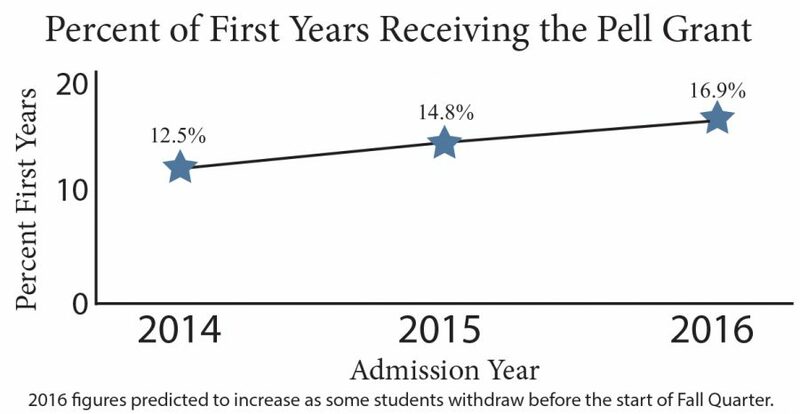 The record percentage is up from 14.8 percent, the proportion of Pell recipients in the class of 2019. The uptick follows a March announcement from University President Morton Schapiro and Provost Daniel Linzer that said they aim to have 20 percent of incoming freshmen be Pell Grant recipients by 2020. In an interview with The Daily, Schapiro said he hopes to reach that goal sooner. In March, Schapiro and Linzer also announced increases to financial aid beginning with the class of 2020. Next year, first-year students who qualify for NU grant assistance will receive financial aid packages with no loans. Unlike loans, Federal Pell Grants do not have to be repaid to the government. Next school year, the grants, designed to help low-income students afford a college education, will offer students up to $5,815 to cover tuition and fees. Mills said 16.9 percent of students in the class of 2020 who have paid their deposits are Pell Grant recipients. This percentage, he thinks, will increase by the end of the summer, after a period he calls the “summer melt,” when some first-year students decide to not come to NU. In the end, Mills said he expects between 17.25 and 17.5 percent of the class of 2020 to be Pell Grant recipients. Steffany Bahamon, president of NU’s Quest Scholars Network and a Pell Grant recipient, said it is important for the University to open its door to students of low-income backgrounds because it helps make the student population more aware of income inequality in the United States. “This University overall has a pretty high median income compared to the median income of the United States,” the McCormick junior said. Achieving greater socio-economic diversity on campus is a great way for NU to combat the growing income inequality in the nation, Bahamon said. This diversity in opinions and experiences can lead to better dialogues on campus and help make the general student population more open to opinions different from their own, she said. Bahamon credited part of the growth of the number of Pell Grant recipients to previous Quest Scholars president and Communication senior Amanda Walsh, who she said spent time working with the administration to increase the number of recipients in incoming classes.